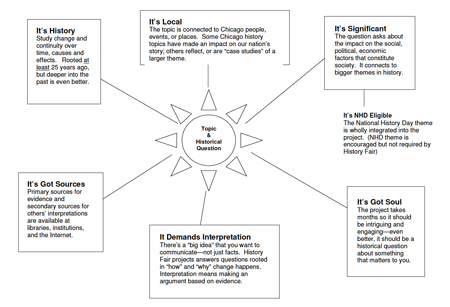 The graphic above from the Chicago Metro History Fair (CMHF) is a great encapsulation of how to choose a topic for a history fair project. In addition, ask yourself the questions listed below. Does the topic relate to the 2018 National History Day (NHD) theme: Conflict & Compromise in History? 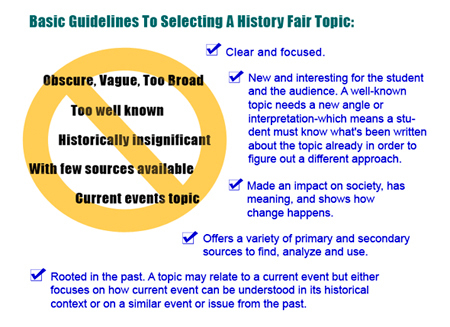 Below we dig a bit deeper and uncover some strategies from TPS-Barat and CMHF for selecting a topic for your history fair project. Each year NHD chooses a particular theme that must be the focus of student projects. For 2018, the theme is Conflict & Compromise in History. Before doing anything else, make sure you understand the theme. Read the theme book National History Day 2018 Theme: Conflict & Compromise in History. Discuss how the theme of Conflict & Compromise relates to people, events, and issues you’ve learned about earlier this year and in previous years and make a list. Review the NHD sample topic ideas and the sample topic resource lists compiled by TPS-Barat, which consist of primary sources & other resources primarily from the Library of Congress. Illinois students need to keep it local so it can help to review the CMHF suggested topic ideas and search the TPS-Barat Primary Source Nexus for related resources. Try filling out one of these worksheets from NHD and CMHF. Download the graphic organizer (.pdf; includes a blank copy).